With the advent of the first commercial examples of vertical farms now up and running, the vertical farm industry is now officially a reality. Over the last two years, it has emerged into the light of day from its virtual womb, the internet, and has taken its first deep breaths. Vertical farming is now in the earliest stage of its growth and development, a place comparable to all the other industries that preceded it, beginning with the very first ones that appeared on the scene in Manchester, England at the beginning of the industrial revolution. Like all the others, the vertical farm industry will undoubtedly undergo remarkable evolutionary changes over the next few years, but in a more rapid and streamlined fashion than its immediate predecessor, the high tech greenhouse industry. This is due largely to the advent of sophisticated computer-controlled indoor environments (hydroponic nutrient delivery systems, efficient, spectrum-specific LED grow lights, innovative, energy-saving HVAC systems, etc., and a robust application of automation), and cutting edge manufacturing technologies, witness, over just the last ten years, the rapid advancement of the cell phone, the hybrid car, wind power, and the latest versions of plasma screen TVs. 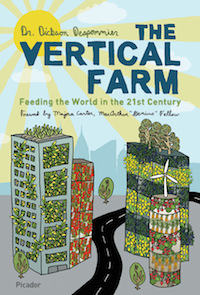 Examples of vertical farms can now be found all over the globe. Here, then, are the newest kids on the block. The island country of Singapore announced last month that a commercial version of a vertical farm was now in operation (Sky Greens – skygreens.appsfly.com). It is a four-story, transparent structure fitted with A-frame growing systems that produce leafy green vegetables. It uses sunlight as a source of energy, and captured rainwater to drive a clever pulley system to move the plants on the grow racks, ensuring an even distribution of sunlight for all the plants. Farmed Here (www.farmedhere.com) opened in 2013 as a commercial-level VF that is housed in a 90,000 square foot post-industrial building in Bedford Park, IL. It produces three products; arugula, basil, and sweet basil vinaigrette. Local Garden (www.localgarden.com) is a newly constructed two-story tall, 6,000 sq. ft. transparent building located on a parking garage rooftop in Vancouver, British Columbia. It is outfitted with an innovative growing platform system (Verticrop: www.alterrus.ca/verticrop/the-technology/) that produces micro-green salad ingredients, baby spinach, and baby kales. Plant factories – aka vertical farms – have been up and running for at least two years, and some have been operational for a lot longer than that. There are some fifty of these indoor vegetable farms spread out over most of the country (e.g., Nuvege –www.nuvege.com; Angel Farms – www.anglefarms.com). Half of them employ sunlight as the sole energy source for growing crops, while an equal number use some variety of LED grow lights. Most of those using grow lights resemble large, windowless warehouses. All of them produce a wide variety of high yield leafy greens. One Japanese online web site estimates that the plant factory industry will grow by over 70 billion yen over the next 5 years, mostly from private investment, and whose progress is largely driven by consumer demand for healthy, radiation-free food in the aftermath of the Fukushima meltdown event. It is anticipated that over the next year or two, the number of viable commercial vertical farm operations the world over will increase at a rate commiserate with city dweller’s demand for safer, reasonably priced, locally grown food. At the same time, severe weather patterns around the world continue to increase in frequency, from extreme droughts to massive floods, and the price of oil remains high. As the result, the availability of food, no matter what the crop, has become more and more problematic, as costs related to production and shipping skyrocket. 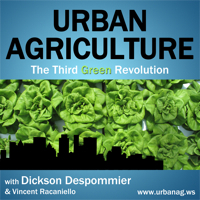 Thus, it now appears likely that vertical farms of a wide variety will become a common feature of the global urban landscape over the next decade, as a global industrial-level response to our ever-changing climate.